Enter the YouTube ID or full URL, then click the “Search” button. OFF = YouTube’s video iframe will be whatever width and height you choose (see Layer Styles). ON = YouTube’s video iframe will cover the enter size of the slider (width and height will both automatically set to 100%). OFF = Video will have a CSS background-size of “contain”. This means the video will never be cropped, but depending on the video’s original size ratio in relation to the slider’s actual size, blank space on the sides of the video may occur. ON = Video will have a CSS background-size of “cover”. This means the video will always cover the entire size of the slider, but depending on the video’s original size ratio in relation to the slider’s actual size, video cropping may occur. * only applicable if “Force Cover” is set to “On”. Video will only play once each time the video is initially played. Choose to autoplay the video when it animates into view. Or choose On 1st Time to autoplay only the first time the slide is shown. Or choose Not on 1st Time to only autoplay after the slide is shown at least once. 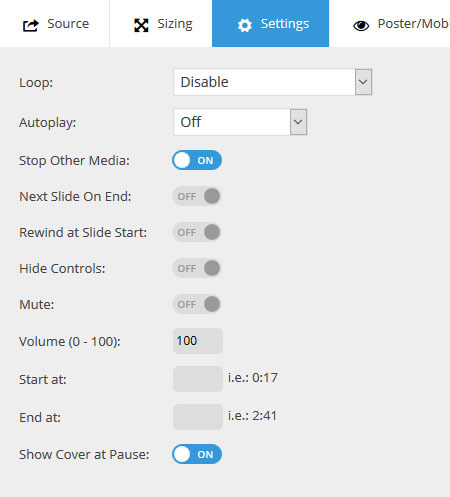 If more than one videos are present in the slide at the same time, choose this option to make sure only one video can be played at a time. If chosen and controls are not hidden, the controls will include a Full Screen button. Choose to hide the video’s default player controls. Set the default volume level for the video. Show the video’s preview image (see Visibility section) whenever the video is paused. For optimal performance, always use a preview image! This way the video will only load from YouTube.com when the video actually plays. Enter a custom url, or click the “Image Library” button to choose an image from the WP Media library. 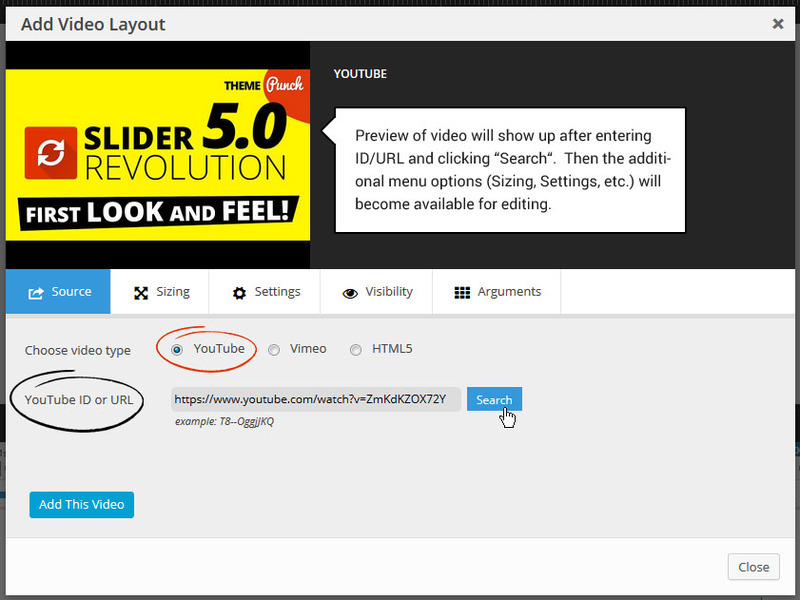 Or choose “Video Thumbnail”, which will then automatically load the video’s preview image from YouTube.com. Choose to disable the video for mobile devices (video layer will simply not be shown). When enabled, only the video’s preview image will be shown on mobile devices (video will never be loaded). Use the following technique to display a play button on top of your preview images. Download the play button from YouTube.com, or create your own. If downloaded from YouTube, resize the button to 75x53 in Photoshop. Upload the button graphic to your site, and make note of its url location. 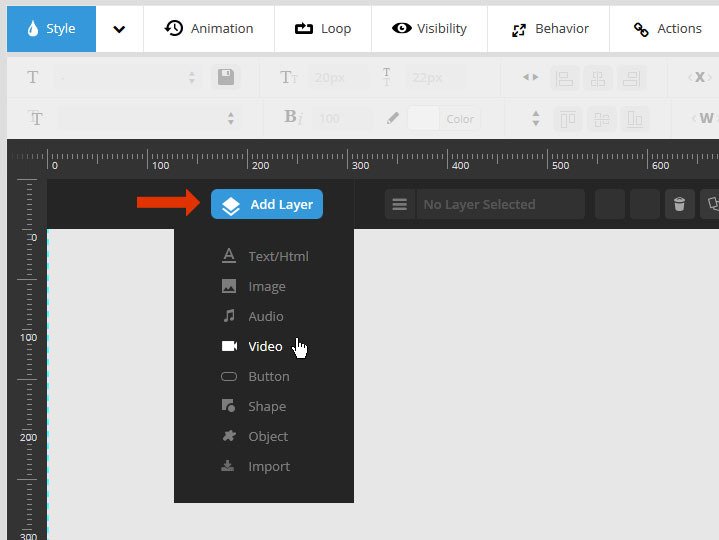 Add the following CSS to the slider's Custom CSS section. “Arguments” are additional parameters that can be passed to the video from this list. Enter the Vimeo ID or full URL, then click the “Search” button. OFF = Vimeo’s video iframe will be whatever width and height you choose (see Layer Styles). ON = Vimeo’s video iframe will cover the enter size of the slider (width and height will both automatically set to 100%). ON: No controls will be shown for the video. 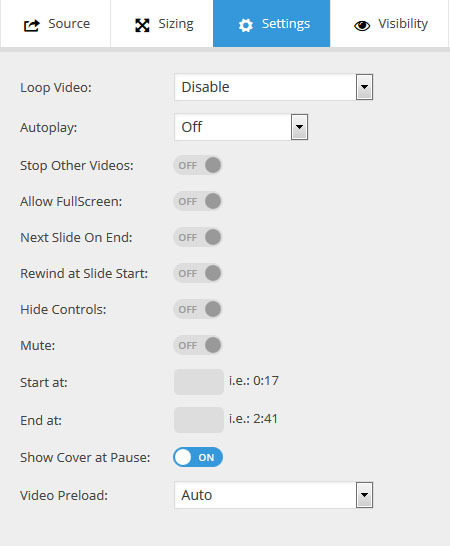 OFF: Video will show the normal default Vimeo player controls. For optimal performance, always use a preview image! This way the video will only load from Vimeo.com when the video actually plays. 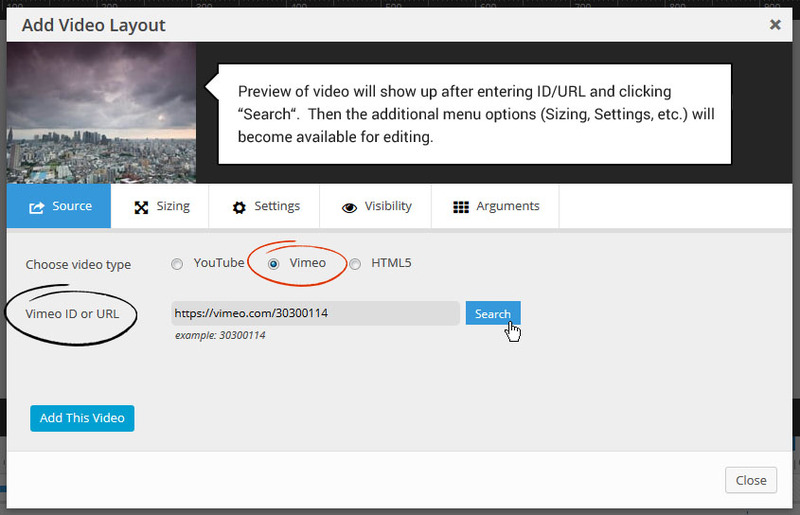 Or choose “Video Thumbnail”, which will then automatically load the video’s preview image from Vimeo.com. Download this PSD and extract its play button graphic, or create your own. Resize the play button to 76x43 in Photoshop. For optimal performance, use a poster/preview image in addition to "Video Preload -> Disable" (see settings here). This way the video will only load when the it actually plays. Click “Set Image” to choose a preview/poster image for the video from your WP Media library, or enter url to the image directly. 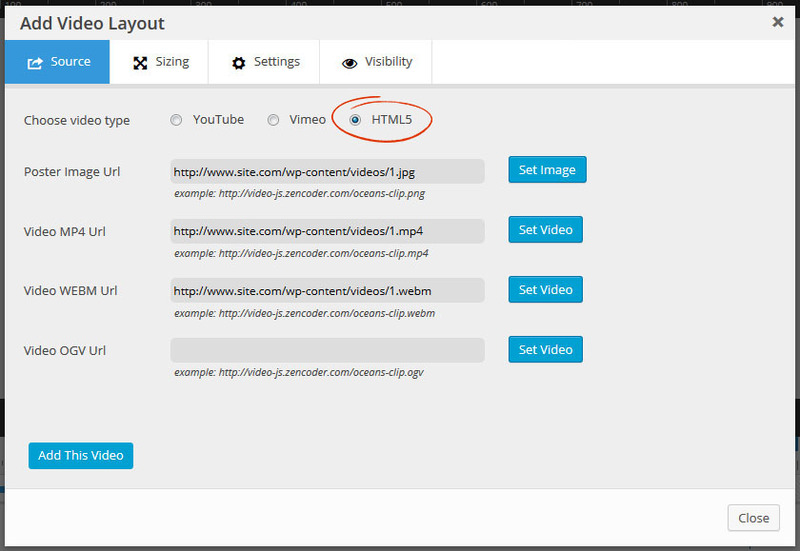 Upload your video files to your website via ftp, and then enter their url locations here. 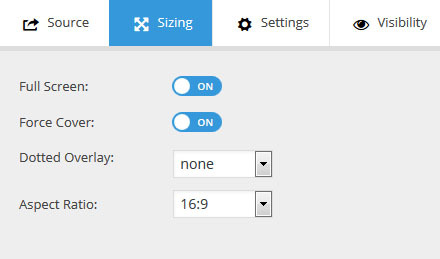 You could also use the “Set Video” option to choose or upload a video from your WP Media library, but depending on the size of your video(s), they may need to be uploaded via ftp. An “.mp4” version of your video is mandatory, and will work almost everywhere except Firefox on Macs. Because of this, it’s also important to include an alternative version of the video, which can be either “WEBM” or “OGV”. Firefox on Mac supports both of these, so you only need one or the other. OFF = Video size will be whatever width and height you choose (see Layer Styles). ON = Video will cover the enter size of the slider (width and height will both automatically set to 100%). Show the video’s preview image (see Source section) whenever the video is paused. The preloading behaviour for the video. If the video is meant to autoplay as soon as its shown, choose “Auto”. If autoplay is disabled, choose “Disable” or “Meta”. When enabled, only the video’s preview/poster image will be shown on mobile devices (video will never be loaded).